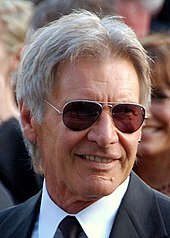 Harrison Ford (born July 13, 1942) is an American actor. He gained worldwide fame for his starring roles as Han Solo in the Star Wars film series and as the title character of Indiana Jones. Five of his movies are within the 30 top-grossing movies of all time at the US box office (when adjusted for inflation). 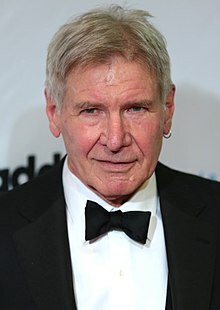 Ford is also known for playing Rick Deckard in the neo-noir dystopian science fiction film Blade Runner (1982) and its sequel Blade Runner 2049 (2017); John Book in the thriller Witness (1985), for which he was nominated for the Academy Award for Best Actor; and Jack Ryan in the action films Patriot Games (1992) and Clear and Present Danger (1994). 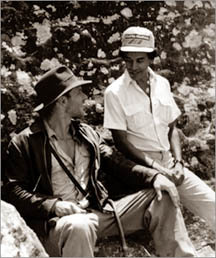 During the June 1983 filming of Indiana Jones and the Temple of Doom in London, Ford herniated a disc in his back. The then-40 year old actor was forcing to fly back to Los Angeles for an operation. He returned six weeks later. Ford is an honorary board member of the humanitarian aviation organization Wings of Hope, and is known for having made several trips to Washington, D.C. to fight for pilots' rights. ↑ "Top 100 Films of All-Time - Adjusted For Inflation". www.filmsite.org. Retrieved June 27, 2018. ↑ Robinson, Will (January 8, 2016). "Harrison Ford is now the highest-grossing actor in U.S. box office history". Entertainment Weekly. Retrieved January 10, 2016. ↑ "Box Office Mojo – People Index". www.boxofficemojo.com. Retrieved November 16, 2016. ↑ Duke, Brad (2004). "1. An Ordinary Upbringing". Harrison Ford: the films. McFarland. p. 5. ISBN 9780786420162. Retrieved February 20, 2010. 1 2 3 Jenkins, Gary (March 1999). Harrison Ford: Imperfect Hero. Kensington Books. pp. 9–12. ISBN 0-8065-8016-X. ↑ "Harrison Ford Biography (1942–)". FilmReference.com. Retrieved May 23, 2008. ↑ Vallely, Paul (May 9, 2008). "Harrison Ford: Whip hand". The Independent. Retrieved April 27, 2018. ↑ Gallagher, William (October 12, 2000). "Harrison Ford". BBC. Retrieved April 27, 2018. ↑ "Mother's Day, Hollywood-style: 20 movie icons with their mums". The Daily Telegraph. March 26, 2017. Retrieved April 27, 2018. ↑ Bloom, Nate (December 12, 2003). "Celebrity Jews". Jewish News Weekly. Retrieved May 23, 2008. ↑ Heath, Chris (September 13, 2017). "Harrison Ford on Star Wars, Blade Runner, and Punching Ryan Gosling in the Face". GQ magazine. Retrieved April 27, 2018. 1 2 3 4 5 6 7 8 9 10 11 12 13 Inside the Actors Studio. Harrison Ford, Season 6, Episode 613. August 20, 2000. ↑ "Ten American showbiz celebrities of Russian descent". Pravda. November 18, 2005. Retrieved May 23, 2008. ↑ Lin, Joseph (May 10, 2010). "Top 10 College Dropouts". TIME. Retrieved August 30, 2016. ↑ Duke, Brad (2005). Harrison Ford: The Films. Retrieved November 1, 2011. ↑ Thomas, Bob (March 4, 2000). "Harrison Ford shy, thoughtful". Bangor Daily News. Bangor, Maine. p. H3. Retrieved May 17, 2015. ↑ White, Dana. "Harrison Ford: Imperfect Hero (9780735100893): Garry Jenkins: Books". Amazon.com. Retrieved February 18, 2012. ↑ "Harrison Ford Wanted Han Solo to Die". Starpulse. March 2, 2006. Archived from the original on May 6, 2008. Retrieved May 23, 2008. ↑ "Star Wars: Episode VII Cast Announced". StarWars.com. April 29, 2014. Retrieved June 12, 2014. ↑ Collura, Scott (June 12, 2014). "HARRISON FORD INJURED ON THE SET OF STAR WARS: EPISODE 7". IGN. Retrieved June 12, 2014. ↑ Ford, Rebecca (June 14, 2014). "Harrison Ford's 'Star Wars' Injury: New Details!". Access Hollywood. Archived from the original on July 15, 2014. Retrieved June 14, 2014. ↑ "'Star Wars: Episode VII' to resume filming". CNN. August 13, 2014. Retrieved August 13, 2014. ↑ "Harrison Ford to return to 'Star Wars'". Chron. August 1, 2014. Retrieved August 14, 2014. ↑ Breznican, Anthony (December 21, 2015). "We Need To Talk About Kylo". Entertainment Weekly. Retrieved December 23, 2015. ↑ Shepherd, Jack (December 25, 2015). "Star Wars 8 casting call reveals Han Solo will be back for Force Awakens sequel". The Independent. Retrieved December 25, 2015. ↑ "Star Wars: Episode VIII Now Filming". starwars.com. StarWars.com. February 15, 2016. Retrieved March 22, 2016. ↑ "Ford took Indiana role to work with Spielberg again". BBC News. March 22, 2016. Retrieved March 22, 2016. ↑ "Indiana Jones: Harrison Ford to appear in fifth film". BBC News. March 15, 2016. Retrieved March 16, 2016. ↑ Jack Shepherd (April 26, 2017). "Indiana Jones 5 release date pushed back by Disney". independent.co.uk. The Independent. Retrieved April 26, 2017. ↑ "What Lies Beneath (2000)". Box Office Mojo. Retrieved February 18, 2012. 1 2 3 4 5 "Harrison Ford Trivia". Internet Movie Database. Retrieved April 23, 2018. ↑ "Harrison Ford Regrets Passing on 'Syriana'". Starpulse. March 3, 2006. Archived from the original on May 31, 2008. Retrieved May 23, 2008. ↑ "2008 Worldwide Grosses". Rotten Tomatoes. Retrieved August 7, 2009. ↑ Kilday, Gregg (January 2, 2007). "Can you dig it? Fourth 'Indy' in '08". The Hollywood Reporter. Archived from the original on July 18, 2008. Retrieved May 23, 2008. ↑ "Dalai Lama Renaissance Documentary Film". Dalailamafilm.com. February 12, 2010. Retrieved March 7, 2010. ↑ Turnquist, Kristi (January 21, 2010). "'Extraordinary Measures,' filmed in Portland and starring Brendan Fraser and Harrison Ford, opens Friday". OregonLive (The Oregonian). Retrieved June 22, 2017. ↑ Fleming, Michael (June 4, 2009). "Keaton, Goldblum join 'Glory'". Variety. Retrieved September 11, 2009. ↑ Graser, Marc (July 24, 2010). "Harrison Ford pleases Comic-Con crowds". Variety. Retrieved November 18, 2010. ↑ Trumbore, Dave. "Corporate Espionage Thriller 'Paranoia' to Star Harrison Ford, Gary Oldman and Liam Hemsworth". Collider. Retrieved April 13, 2012. ↑ Donnelly, Matt; Sneider, Jeff (February 26, 2015). "Denis Villeneuve to Direct 'Blade Runner' Sequel Starring Harrison Ford". TheWrap.com. Archived from the original on March 29, 2015. Retrieved June 20, 2015. ↑ "Blade Runner 2049". Rotten Tomatoes. Retrieved December 28, 2018. ↑ Collura, Scott (September 29, 2017). "Blade Runner 2049 Review". IGN. Retrieved June 18, 2018. ↑ N.B. (October 6, 2017). ""Blade Runner 2049" is a flawed replicant". The Economist. Archived from the original on October 8, 2017. ↑ Pamela McClintock (September 21, 2017). "'Blade Runner 2049' Losses Could Hit $80 Million for Producer Alcon". The Hollywood Reporter. Archived from the original on December 21, 2017. Retrieved December 26, 2017. ↑ Jr, Mike Fleming (April 25, 2018). "Harrison Ford Takes First Animated Role, In Illumination's 'The Secret Life Of Pets 2'". Deadline. Retrieved September 27, 2018. ↑ Lang, Brent (July 16, 2018). "Harrison Ford Eyes 'Call of the Wild' (EXCLUSIVE)". Variety. Retrieved September 27, 2018. ↑ "Harrison Ford Proposes to Calista Flockhart". People. March 21, 2009. ↑ "Harrison Ford and Calista Flockhart Get Married!". People. June 16, 2010. ↑ France, Lisa Respers (November 17, 2016). "Carrie Fisher writes of Harrison Ford affair". CNN.com. ↑ "Ford's Filling Station L.A. Live". January 1, 2014. Archived from the original on August 22, 2015. Retrieved August 27, 2015. ↑ "Ford's Filling Station at LAX". Retrieved February 27, 2017. ↑ Ford, Willard. "Stong Sports Gym – A Unique Place For Martial Arts". Retrieved September 15, 2015. ↑ Asch, Andrew (June 6, 2009). "Ludwig: The Composer's New Clothes". Apparel News. Archived from the original on June 12, 2010. Retrieved August 27, 2011. ↑ Rinzer, J. W. (2008). The Complete Making of Indiana Jones: The Definitive Story Behind All Four Films. New York: Del Rey, imprint of Random House, Inc. p. 153. ISBN 978-0-345-50129-5. Lucas arrived on June 20, . "Harrison was in really terrible pain," he says. "He was on the set lying on a gurney. They would lift him up and he'd walk through his scenes, and they'd get him back on the bed." That same day Ford filmed his fight with the Thuggee assassin in Indy's suite on Stage 3. "Harrison had to roll backward on top of the guy," Spielberg says. "At that moment his back herniated and Harrison let out a call for help." ↑ "Harrison Ford breaks ankle on Star Wars film set at Pinewood studios". BBC News. Retrieved October 2, 2014. 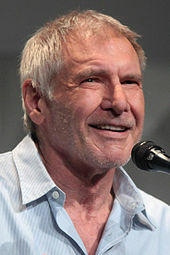 ↑ "Harrison Ford credited with helicopter rescue of sick hiker in Idaho". CNN. August 7, 2000. Archived from the original on February 2, 2008. Retrieved May 23, 2008. ↑ Freeze, Di. "Harrison Ford: Promoting Aviation through Young Eagles" Archived August 28, 2011, at the Wayback Machine Aviation Journals. September 2005. ↑ Donaldson, Lynn. "Harrison Ford Crafts a Masterpiece in Wyoming" The Land Report. October 2007. ↑ "Harrison Ford Discusses Piloting His Beaver into the Bush", Huffington Post, May 21, 2008. ↑ Per Ford's remarks on Late Night with David Letterman (viewed July 9, 2008). ↑ "Harrison Ford Flies 2 Millionth Young Eagle". Retrieved August 25, 2016. ↑ Richards, Paul (January 9, 2015). "Wings Over The Rockies". YouTube. Retrieved August 30, 2016. ↑ "Living in the Age of Airplanes Official Trailer 2 (2015) - Airplane Documentary HD". Youtube. Retrieved January 12, 2017. ↑ "Wings of Hope's Honorary Council Members". Wings of Hope. Retrieved March 14, 2017. 1 2 "51 Heroes of Aviation". Retrieved October 25, 2014. ↑ AirSafe.com, LLC. "Helicopter Accident Involving Actor Harrison Ford". Airsafe.com. Retrieved June 12, 2014. ↑ "LAX00LA024". National Transportation Safety Board. Archived from the original on May 15, 2003. Retrieved May 23, 2008. ↑ Blankstein, Andrew (March 5, 2015). "Harrison Ford Reported Fair After Plane Crash". NBC News. Retrieved March 5, 2015. ↑ Dillon, Nancy; Blidner, Rachelle (March 6, 2015). "'My first instinct was to run to the airplane': Surgeon recalls moment he helped Harrison Ford after crash". New York Daily News. Retrieved March 6, 2015. ↑ Schwebke, Scott (February 14, 2017). "Harrison Ford lands plane on taxiway instead of runway, flies over passenger jet at John Wayne Airport". The Orange County Register. Retrieved February 14, 2017. ↑ "Harrison Ford: There are no great movies on global environmental issues". CNN. Archived from the original on May 2, 2013. ↑ "About Us". Conservation International. Retrieved February 3, 2012. ↑ "Harrison Ford Shocks Indonesian Minister with Heated Climate Interview". Australian Broadcasting Corporation. September 10, 2013. Retrieved September 11, 2013. ↑ Bachelard, Michael (September 11, 2013). "Harrison Ford Upsets Indonesian Minister with 'Rude' Interview". The Sydney Morning Herald. Retrieved September 11, 2013. ↑ "FM Bemoans Harrison Ford's Attitude". The Jakarta Post. September 9, 2013. Retrieved September 11, 2013. ↑ "Harrison Ford's Environment Documentary Questions 'Shocked' Indonesian Forestry Minister". Huffington Post. September 10, 2013. Retrieved September 11, 2013. ↑ "Harrison Ford Interviews Indonesia President Susilo Bambang Yudhoyono On Environment". Huffington Post. September 10, 2013. Archived from the original on September 12, 2013. Retrieved September 11, 2013. ↑ "Harrison Ford, Indonesia President Discuss Climate". The San Diego Union-Tribune. September 10, 2013. Retrieved September 11, 2013. ↑ "Harrison Ford". Our Planet. Archived from the original on September 5, 2008. Retrieved May 23, 2008. ↑ "EarthShare PSA: "Promises"". Earthshare. October 1, 2008. Retrieved December 27, 2017. ↑ "Discover Hetch Hetchy with Harrison Ford Preview". Restore Hetch Hetchy. Archived from the original on November 19, 2012. Retrieved May 16, 2013. ↑ "Years Of Living Dangerously". yearsoflivingdangerously.com. 2015. Retrieved May 17, 2015. ↑ "2008 Presidential Donor Watch". Newsmeat. Archived from the original on February 5, 2010. Retrieved May 23, 2008. ↑ Khashyar Darvich (January 1, 2009). "Celebrities and others banned from entering Tibet or China". Dalailamafilm.com. Retrieved November 11, 2010. ↑ "Harrison Ford blasts US Iraq policy". The Age. Melbourne, Australia. August 27, 2003. Retrieved May 23, 2008. ↑ McAfee, Melonyce (December 11, 2015). "Harrison Ford has a fan in Trump". CNN. ↑ Dawn, Randee (December 11, 2015). "Harrison Ford reminds Donald Trump that 'Air Force One' was only a movie". today.com. ↑ "About the AIA". Archaeological Institute of America. Retrieved September 7, 2010. ↑ "Harrison Ford surprises 'Star Wars' fans in new Force For Change charity video". November 19, 2015. ↑ "Star Wars: Harrison Ford Surprises Fans in New Force for Change Video". November 19, 2015. ↑ "Disney Pushes 'Indiana Jones 5' a Year to 2021, Dates 'Maleficent 2,' 'Jungle Cruise'". The Hollywood Reporter. July 10, 2018. ↑ "AFI Life Achievement Award". Retrieved February 17, 2012. ↑ "Guys Choice 2008 – Harrison Ford". Spike TV. Archived from the original on August 4, 2008. Retrieved August 31, 2008. ↑ "Guys Choice". PR Inside. Archived from the original on May 14, 2012. ↑ "Sixth Annual Living Legends of Aviation Awards". Retrieved October 25, 2014. ↑ "Harrison Ford Receives Freedom of Flight Award". Archived from the original on February 16, 2015. Retrieved October 25, 2014. ↑ "Harrison Ford receives aviation's highest award". Retrieved October 25, 2014. ↑ "Harrison Ford Receives Al Ueltschi Humanitarian Award". Retrieved October 25, 2014.